Burn Rubber City, Burn! Akron, Ohio: Punk and the Decline of the Mid-West 1975-80. I was not here for the fluorescence of the punk scene in Akron or Cleveland. During the late 1970s I lived in Binghamton, New York, another dying manufacturing city, but a town that didn’t know it was well-suited to the genre. It relied instead on metal, disco, hard rock, and whatever was transported from New York City to the Southern Tier by college students (mostly Springsteen, I recall, followed by New Wave). Thus, I cannot claim first-hand experience, as many around here can (or some who may claim to but can’t). I was, of course, familiar with Devo and the Waitresses through their hits, and the Bizarros because of their connection to New York. 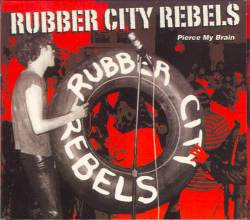 As a result of my poking around in Northeast Ohio music history, Rubber City Rebels, Tin Huey, and the Numbers Band have become familiar (and enjoyed). Most of the rest are largely unknown to me, some having a moment in the sun, others not. Thus I enter the discussion with a bit of trepidation. This album is the fifth punk compilation from the British label Soul Jazz. The first four concentrated on the British and American scenes, proto-punk, and Cleveland (we’ll get to that one soon). As such, it is a late-comer to the dissection of the late-70s Akron punk/art rock/New Wave scene that coalesced in the wake of Akron’s industrial decline. There have been other releases, notably Stiff Records’ The Akron Compilation, and two films, It’s Everything, and Then It’s Gone, and If You’re not Dead, Play. There have been reunions, cover bands, and much mythologizing, and everyone seems to have a slightly different version of what happened, ranging from the glorious to the “who cares?” So, what does this CD add to the pile? First, for the newbie, or those too young to have experienced these bands in the raw, the CD provides an entryway into a particular time and place (late 1970s, Akron/Kent) and the heady mix of local bands influenced by the art scene (and shootings) at Kent State University, the decline of the rubber industry in Akron, and the local music scene (that also included Cleveland) of the time. The accompanying booklet is pretty good in outlining major events (although they spell it “tyre”), although it could have done much more. But it’s the array of music and styles that are the real draw here. Akron “punk” was far more, and not easily categorized, except by music industry. It included a great deal of art rock, experimental rock, garage rock, and blues, put in a blender with the top off, resulting in fascinating chunks of music going in all different directions. Little holds it all together except point of origin, common history, a certain sense of aggression, and the fact that the bands influenced each other (and even shared personnel). Quality of sound is very good, and given that the Stiff Compilation is out of print (as are most of the original albums of the artists, other than Devo’s), this is the place to go for this material. Rachel Sweet is missing, but there are compilations of her material elsewhere. There are some wonderful surprises. Jane Aire & the Belvederes is a great band. They apparently followed Chrissie Hynde to England to join the music scene there, and their albums seem to have never been reissued in CD. Denis DeFrange did some fascinating experimental work with synthesizers (not exactly a punk instrument). Chi-Pig, on the scene since the 60s in one form or another and the only all-female band, combines punk with elements of experimental music to considerable effect. The lesser known artists are surrounded by the Bizarros, Rubber City Rebels (my favorite), Tin Huey, and couple of demos by Devo, all of whose tracks provide great listening, especially as juxtaposed here. The Numbers Band rounds out the album with their usual combination of experimental rock and blues. The result is an indication of the creativity and complexity of the music scene in the region for a time when much was bleak, but anything was possible. In all, this is an excellent compilation, and well worth the time. Personnel/Tracks: The Bizarros/I Bizarro; The Waitresses/The Comb; Hammer Damage/Laugh; Devo/Mechanical Man; Tin Huey/Squirm You Worm; The Bizarros/Lady Doubonette; Chi-Pig/ Ring Around the Collar; Devo/Auto Modown; Rubber City Rebels/Kidnapped; Denis DeFrange and Mark Frazer/The Minkin Shuffle; Jane Aire & the Belvederes/When I Was Young; Tin Huey/ Puppet Wipes; Chi-Pig/Apu Api (Help Me); The Bizarros/Nova; Rubber City Rebels/Such a Fool; Denis DeFrange/Sector Wars; Ralph Carney/Closet Bears; 15 60 75 The Numbers Band/Narrow Road. The opening track detonates into a blast of promise with a gale of electric guitar riffs and pounding drums to boil the notes for Crown of Phantom's genesis. At the start it's like a climactic showdown, and the solos ring with an amped uproar, a true blitz of sound that foretastes something grim and grand. Isolation, resentment, ire at the artificiality of the entertainment industry, there's plenty in the targeting reticles of the imagery for Crown of Phantoms. Disgust abounds. Many a band has slammed the gaudiness and predatory glamour of Hollywood for all the fraud, faux wisdom, and seduction that its altar is built upon, and the indictment contained in the above lyric from "No Mercy" is reminiscent of songs like "Lost in Hollywood" from System of a Down. A familiar metalcore story slinks into your ears, a gray tale about hardened souls stacked against the inevitable, punishing trials of life, with never a hint of surrender in the words. Would that it all developed into something more interesting. Instead, this release felt like a capped venture. Think of a movie touted by an awesome preview that, upon viewing, actually ends up being an okay experience. Therein lay a comparable feeling for what Crown of Phantoms offers. While not something to be completely discarded the album suffers from anything really distinguishing it from the pack of the overall rock genre. If you were killing time in your car on a lunch break or wanted to liven up a senior living center then these tracks could serve such purposes, the latter possibly being met with some objections. Aside from the very tempting track at the beginning the impact fades. There's nothing amateur here so much as uninspired, and while for the most part everything is well-played by the group and finely screamed by Mark Hunter the flames of allure diminish with bright spots in the blandness. The instrumentals are tactful and sharp, notable for the line-up since most of the personnel on this album were all recent additions to Chimaira's line-up. No one fails to perform their roles well but it's simply that the total end product is not anything all that memorable. A comparison to past albums does not amount to much because there is simply little to explore here. Metalcore enthusiasts may very well be perfectly happy with this release the same way a college fraternity would be satisfied with a case of cheap vodka being thrown onto their porch. That's not intended as a put down since the high-octane followers of this subgenre reward hard punches of music, and there's no lack of those with Crown of Phantoms. 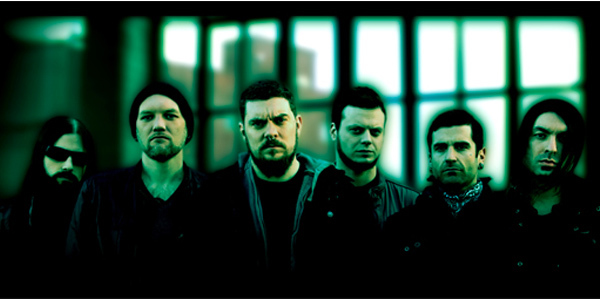 Have chasers ready from other Chimaira albums and you could possibly pull some songs from here to make a playlist for a buddy or a road trip. In ancient lore all the heads of the monstrous chimera were different, be they breathing fire, snaking a long tongue, or snapping a beak. From the perspective of this heavily belated review the defining characteristic for this album's head is that it appears to have peacefully nodded off. As the last chapter in the story of this band they could have done worse. 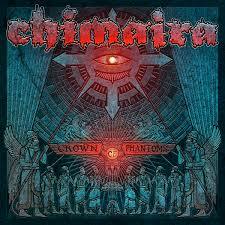 Rest in piece, Chimaira, and rest assured that this is not a bad album, just an average one. Personnel: Jeremy Creamer (Bass Guitar), Austin D'Amond (Drums), , Emil Werstler (Lead Guitar), Matt Szlachta (Rhythm Guitar), Sean Zatorsky (Keyboards, Additional Instruments, and Backing Vocals), Mark Hunter (Lead Vocals). Tracks: The Machine, No Mercy, All That's Left Is Blood, I Despise, Plastic Wonderland, The Transmigration, Crown of Phantoms, Spineless, Kings of the Shadow World, Wrapped in Violence, Love Soaked Death.